Tonight I blocked in my newest painting. I have painted the sky, using manganese blue, phthalo blue, titanium white and a touch of alizarin crimson. I have blocked in the rest of the canvas using thin paint and a limited palette. At this point, I have not worried too much about precise colours, but have aimed to place the main shapes and cover up most of the white canvas. I have also indicated the darker shadow areas. Quite often, before I have finished blocking in, I get distracted and start putting in detail, or trying to represent the exact hue that I see in my reference photos. Usually, that just leads to trouble! A colour that looks just right on the white canvas will look wrong once other colours surround it. 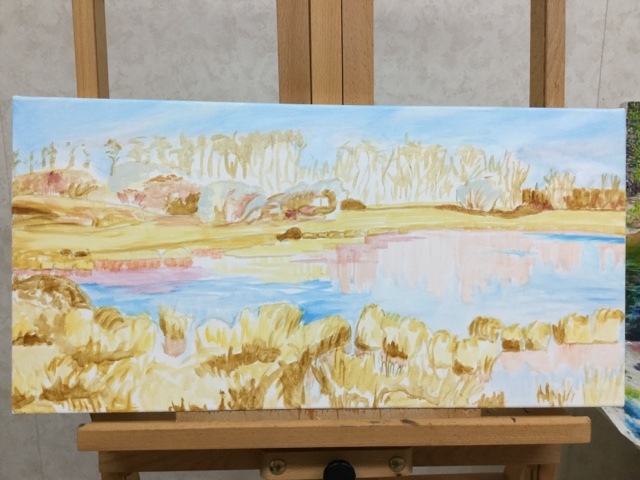 You can see in this one that I have suggested the texture of the reeds, the direction of the reflections, and the shininess of the pond. I have found that, even in the very early blocking in stage, I have to capture some of the key elements that I find interesting in the scene. Otherwise later on, I will lose the rhythm of the painting, or the concept I am trying to convey. I feel that I have been successful if I have left myself something interesting to work with in the next painting session. Every time I start a new painting, I set myself a particular challenge. The challenges relate to things I want to learn, or issues that I have struggled with. With this painting, I have set two challenges. One is the long narrow landscape format of the canvas. I rarely paint in landscape format, but rather tend to choose a portrait orientation for my paintings (even though I mostly paint landscapes). And I have never tried a long narrow format. 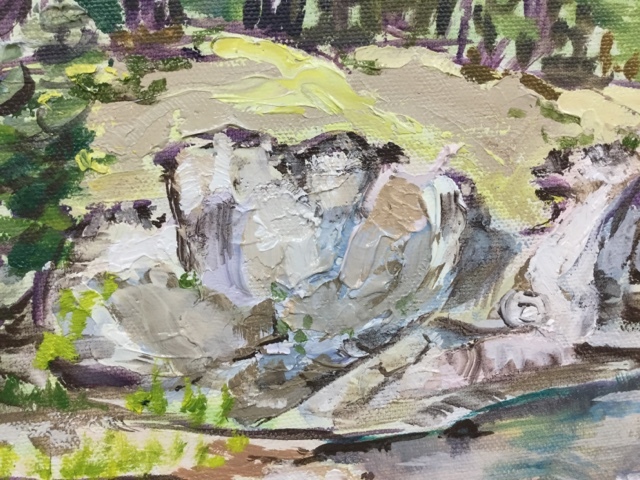 The other challenge in this painting is that I am aiming to paint with confident looser brushstrokes, rather than reverting to finicky, precise dabbing. I think this will prove to be particularly challenging for me, especially as I have chosen a complex composition. In the previous painting that I just completed, Kettle River, Before the Fire, I had two challenges. One was to paint a large section of intense colour (the blue water). Although I am not afraid to use intense colours, I tend to daub it on in small bits, and therefore end up with very busy images. The other challenge in my last painting was to paint a large section of green trees. I find green very hard to work with, and always struggle when there is a lot of green in a painting. Other challenges I have set for myself in recent years include: painting nocturnes to force myself to use more dark values; working more with greys; using a larger canvas; painting large calm areas of muted colour; incorporating a figure in the landscape; incorporating buildings and other structures; painting en plein air, and painting waves or running water. I almost always run into trouble with a painting at some point. But I am always learning new things, and I never get into the rut of painting the same objects or themes over and over, in the same way, with the same palette of colours. For me, problem-solving a painting is half of the fun! I have just finished another painting. 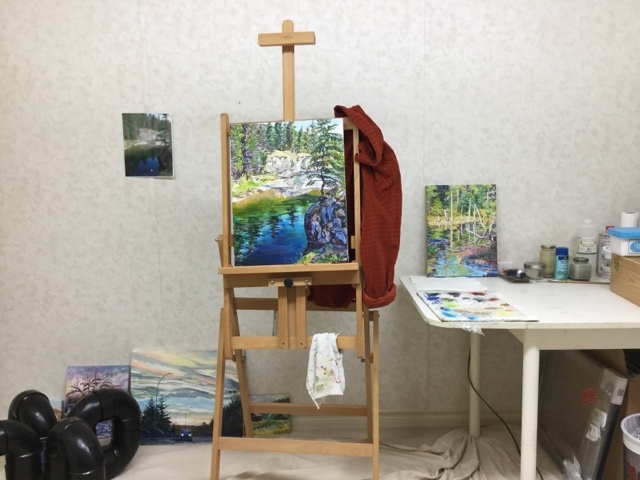 It's the one on the easel, titled: Kettle River Before the Fire. Kettle River Valley is one of our favourite places to spend time in the summer. It is located in southern British Columbia, Canada, just north of Osooyos and south of Kelowna (accessible from Kelowna by the back road). The area is most well known for the Kettle River Valley Railway, which was dismantled and turned into an amazing bike trail. We have biked the 25 Km section north from Rock Creek, and have fantasized about doing a multi-day trip along it or connecting to one of the other trails in the network of old rail lines. I took this photo on one of our biking excursions. About seven km north of Rock Creek, there is an excellent provincial campground right on the Kettle River. Or, I should say, there used to be a great campground. Last summer, a terrible wildfire raged through the valley. People camping in the campground got out with minutes to spare. The tiny hamlet of Rock Creek also burned. I think I remember reading that 14 homes were lost. Last summer, we camped in the Kettle Valley. In fact, we had just left the area the day before the fire started. There had been a drought all summer, and the valley was bone dry. It was one of many wildfires that razed huge sections of southern BC and northern Montana last August. So this painting has special meaning for me. It reminds me of the happy times in the Kettle Valley, before the fire. I started painting this picture at the beginning of September. And then I broke my foot. For the four months I was on crutches and in a cast, I stopped painting. I just felt ready to start again in February. I am part of a painting group that meets weekly. But because of my work schedule, I miss a lot of the painting nights. I usually finish a painting in 4-6 sessions, depending on how large it is. Here is a closeup showing some of the detail. As you can see, I had fun with the palette knife in this section. It is great to be painting again! 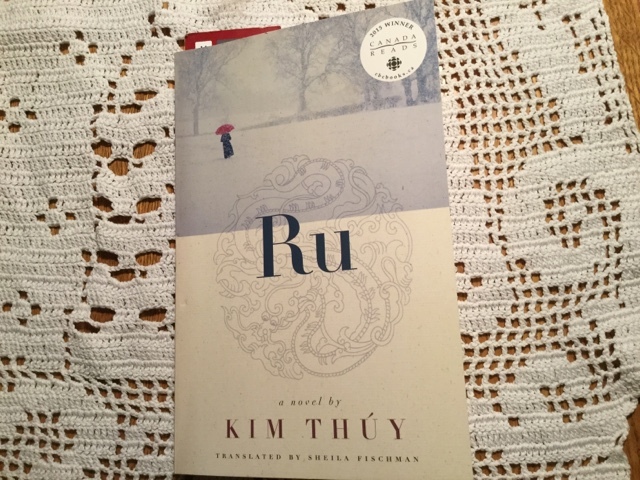 The following quote is from the book Ru, by Kim Thuy. Her book was the 2015 winner of the Canada Reads contest. "My parents often remind my brothers and me that they won't have any money for us to inherit, but I think they've already passed on to us the wealth of their memories, allowing us to grasp the beauty of a flowering wisteria, the delicacy of a word, the power of wonder. Even more, they've given us feet for walking to our dreams, to infinity. Which may be enough baggage to continue our journey on our own. Otherwise, we would pointlessly clutter our path with possessions to transport, to insure, to take care of" (p. 41). From this brief excerpt, so concise and poetic, it is clear why Thuy's book was a winner. I am going to have the great fortune to attend a talk by Kim Thuy next week. I, unfortunately, continue to clutter my own path in life with possessions, as I have written about here.